The very essence of our company is quality. Nowhere is this more visible than when it comes to the materials we use or the way we work with you as customers. On the material side of things we always try to use sustainable products (providing quality is not compromised). The majority of the companies we deal with are small local businesses and all of the timber we use comes from F.S.C. registered companies. From a customer service point of view we are here for you and will always work with you to ensure that we get the best solution for you. We promise never to sell you something just for the sake of getting a sale – we want you to have a great experience so that you always remember us with fond affection! 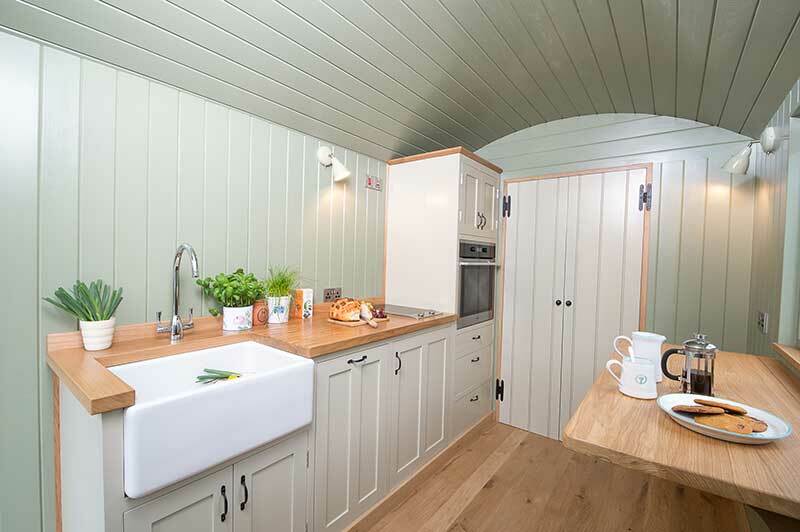 All of our shepherd huts are as individual as the people that buy them. We have totally designed and built our products ourselves, using the original shepherd hut as our inspiration, taking the best of the old and combining with the convenience of the new to create your unique space. We can work with you directly to create your ideal hut, or we can work with your architect to create something to sit in your newly landscaped grounds or garden. Rough sawn oak is cut to shape before being finely sanded and then coated in Danish oil. The chassis is the foundation to any shepherd hut and our ultra-strong oak and metal chassis have been designed to not only be aesthetically pleasing but also to be durable and hard-wearing enough to withstand the elements for centuries to come. The framework is then constructed using 64mm x 38mm pressure treated timber, fully braced to provide sturdy walls and great support for the roof structure. The walls and roof are covered with a waterproof yet breathable membrane before the traditional curved corrugated roof sheets are fixed to form the essential barrier to the elements. The sheets are covered with a black plasticised coating to ensure optimum life span. A barge board and fascia is then fixed all the way round giving a beautiful finish. The wall, floor and ceiling cavities are then filled with the high performance, safe and environmentally friendly sheep wool insulation. The interior walls and ceiling are clad in 20mm thick vintage finish redwood boarding. The flooring, skirting, shelves and window sills are fitted out with solid 20mm oak boards and finished with a beautiful hard wearing wax oil finish. We use exceptionally high quality ironmongery as standard but can accommodate any special requests with ease. 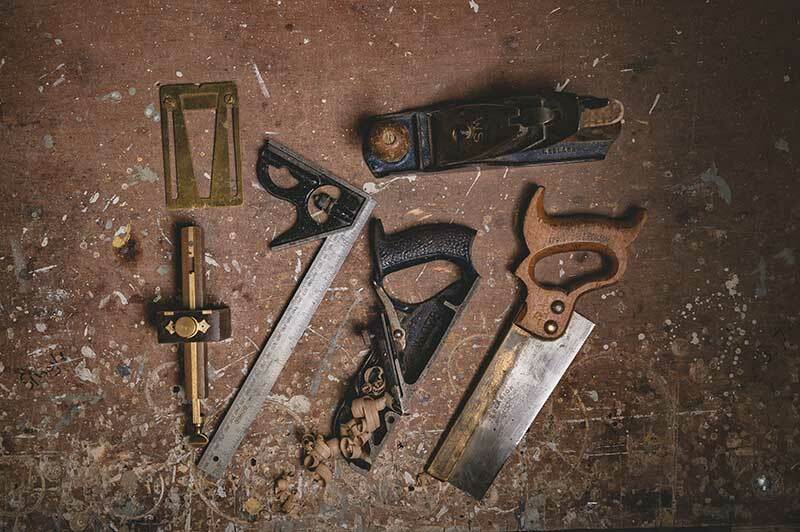 All of our joinery is hand made locally specifically for our shepherd hut – which means that we can pay attention to the little details to ensure that you won’t have water ingress into your hut round any windows or doors. Inside the options are endless, with the placing of the plumbing and electrics entirely up to you and to suit your floorplan. The hut as standard will be decorated inside but we can add all the extras that you can dream up. We’ve done larders, kitchens, bunk beds, concealed TV’s and all manner of options – the only limit is your imagination. We can engage interior designers if you require but if not, then it’s over to the designer in your house to fit it out with your own personal treasures and soft furnishings – send us a photo when you’re done please! The Turnkey – our fully kitted solution with bathroom, kitchen area and fold-down wall bed. The Brace – two shepherd huts linked together – affording shepherd hut feel with added accommodation. The Retreat – we just provide an empty hut with lighting and electrics in this layout – the rest is up to you. The Towby – our fully road legal road-towable solution. The Self-build Maker’s Hut – this is the one for the artisan’s among you, allowing you to indulge your inner workman or woman and build you own. All of the above are available in our Heritage exterior cladding, which is a painted wriggly tin – or our Quercus exterior cladding, which is a feather-edged oak cladding which will last for generations. For more information on how your hut is made, what options are available and most importantly, what our current customers have to say about us – please click here to view our Introduction to Blackdown Shepherd Huts video.